There is no mistaking that online gaming has changed over the years. Not only now are there a variety of genres available, but there is specialized equipment available that can get you the edge over your competition. Equipment like the gaming mouse. That being said choosing the best silent gaming mouse can be a difficult task. This is especially true when you sit down and consider the wealth of options that you have available to you. Gaming mice come available in an overwhelming variety of shapes, sizes, and colors. This is not to even mention other features like sensitivity and noise levels. You no doubt have a difficult task at hand, but with this helpful guide, you will find all the information that you need to purchase the very best gaming mouse. When shopping your very best hurdle will be deciding between the laser or optical sensor mouse. In the past, gamers from all around have boasted that the optical mouse is superior because it provides quicker reaction responses and increases the overall gaming experience. It has also been said that optical mice do not lag like the laser mice. However, with the increase in technology over the years the laser mouse has jumped leaps and bounds. There are now some gamers out there that are claiming that the laser mouse is now superior. There are plenty of laser mouse manufacturers out there that are boasting about their lag-free gameplay so this is something that you will want to look for when shopping. Early on in your shopping venture, you will quickly discover that gaming mice are rated in DPI. The DPI rating is nothing more than the amount of space that you have to move the mouse on the desk to get the cursor to move on the screen. For instance, the higher the DPI rating, the less you will have to move the mouse for the cursor on the screen to travel for distance. A lower DPI rating means that you are going to have to move the mouse greater distances to reach your cursor destination on the screen. If you want to have the greatest control over your character, cross-hair or cursor it is best to opt for a mouse that is rated anywhere from 800 to 100 DPI. As a gamer, it is safe to assume that you spend long hours engaged at your computer. You probably get into the action with your headphones on and are clicking like a mad man. Well, that clicking is rather loud and can annoy those around you. 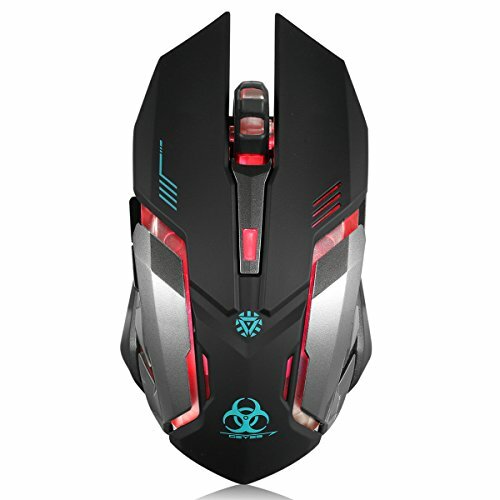 If you want to game into the wee hours of the night and not disturb your friends or family, you should consider a silent click gaming mouse. This will allow you to game into the late hours without disturbing anyone. You will also have to decide between a wired or wireless mouse. Some gamers like the wireless option because it allows them to feel untethered while others claim that the wired is more responsive. However, wireless technology has come a long way and wireless mice are rather responsive these days. Just keep in mind that the wireless option will be more expensive. When you first lay eyes on the Logitech G502 Proteus, you will probably be taken back by the design. This mouse really looks like something from the future. Well, it is safe to say that it also performs like something from the future. When you see everything that it has to offer, you will have no choice but you agree. The first thing you need to know about this innovative gaming mouse is that it is equipped with an advanced optical sensor. This unique sensor is Logitech’s most accurate and responsive sensor that translates into precise and accurate hand movements onscreen. If you want your character to be more responsive to your movements then this is the mouse for you. Some players like a certain feel while others prefer a different feel. When you invest in the Logitech G502 Proteus, you really get to customize your experience thanks to the tunable weight and balance. With a repositionable 3.6G weight, you won’t have a problem finding a superior fit for your playing style. The mouse also boasts a 200 to 12,000 DPI and a cable length of six feet so you won’t have a problem maneuvering your characters. Another unique customizable feature that comes included with the Logitech G502 Proteus is the RGB customizable lighting. With 16.8 million colors to choose from, you can really match the lighting to suit your specific environment. The mouse is only compatible with Windows 7 or later, Mac OS x 10.10 or later, and Chrome OS. Another feature that cannot be overlooked is the eleven different customizable control buttons and hyper-fast scroll. With these features, you can set each different button to perform specific tasks. Being able to access certain features and in-game options quicker will give you that split second timing advantage that you need over the competition. The hyper-fast scroll wheel really allows players to make fast and accurate movements as well. 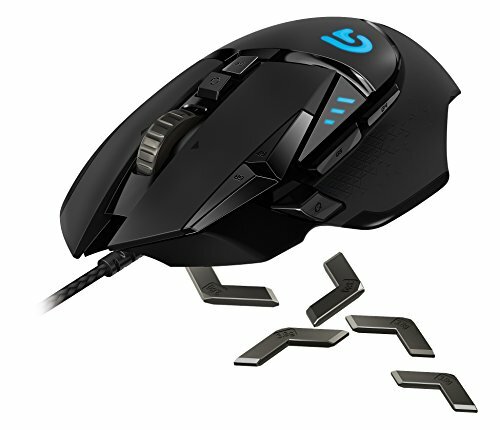 The Logitech G502 Proteus certainly is an impressive gaming mouse in appearance and performance. It offers all the essential gaming features plus more. The Logitech M330 might not look as impressive as the mouse listed above, but it certainly makes up for it with performance and functionality. Just look at the wireless feature. Without a cord restricting you, you will literally be free to make all the movements and adjustments that you need to. This will get you the advantage over the players that are tethered right next to their computer. 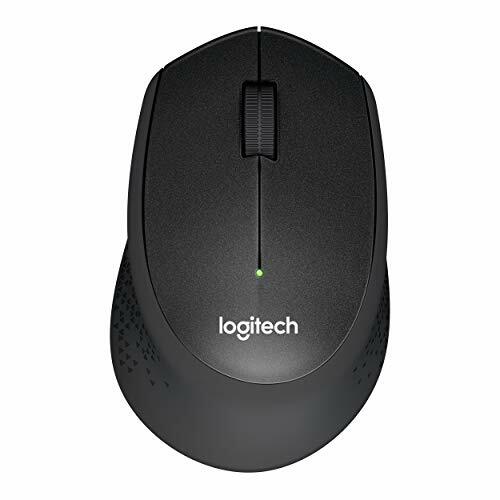 However, do not be fooled by the wireless capability because the mouse certainly offers the type of responsiveness that you would come to expect from the Logitech company. Did you know that the Logitech Company was the first company in the world to receive that Quiet Mark certification for the UK Noise Abatement Society? Well, they are and the UK Abatement Society is a society that was specifically developed to recognize technology designed to reduce noise. And, that is exactly what the Logitech M330 does. In fact, it reduces that clicking noise by 90%. With this noise reduction, you never have to worry about disturbing those around you. When it comes to wireless mice most gamers are always concerned about battery life. They simply don’t trust the battery like and don’t want the mouse to die right in the middle of an intense gaming session. Well, the Logitech M330 boasts two years of battery life. The mouse also comes equipped with a neat little auto-sleep feature that will help conserve battery life when the mouse isn’t in use. The Logitech M330 was expertly crafted to contour to the grips of your hand and it is constructed of soft rubber to add to the overall comfort. You could literally spend all night gaming or working with this mouse and not experience and cramps of discomfit at all. This combined with the 90% noise reduction and you can game all day and night long without worrying about cramps of disturbing others around you. You can see that the Logitech M330 doesn’t quite look like it came from the future, but it certainly has features that make it one of the very best quiet gaming mice on the market. When it comes to looks and capabilities it will be hard to match the VicTsing Wireless Gaming Mouse. This mouse is certainly impressive and tough looking, but it offers features that are just as impressive. The first thing that you need to know about this mouse is that it is completely wireless. It features 2.4G wireless technology that provides a stable connection, precise tracking, and fast data transmission speeds. It also offers up to thirty feet of working distance, eliminates delays, dropouts, and interference. This mouse is perfect for both gaming and casual use. Once again, when it comes to battery life, you needn’t be concerned with the VicTsing Wireless Gaming Mouse. It comes equipped with a unique advanced energy-saving chip that will put the mouse int sleep mode when it is idle for eight minutes. All you have to do is simply click a button or move the mouse and it will wake right back up. However, there is also a handy on/off switch in the event that you want to manually turn the mouse off and on. Another thing that you need to know about the VicTsing Wireless Gaming Mouse is that it is extremely quiet. The left and right buttons produce little to no noise when they are clicked. This makes this mouse perfect for gaming into the late hours or gaming in public, libraries, Internet cafes, or dormitories. However, do not be fooled by the quiet clicking operation because the mouse is extremely durable. Most gamers these days have grown accustomed to their specific operating systems. For instance, some gamers like the Windows systems and would never be caught dead using a Mac. Some gamers prefer the Mac. Sometimes this can make buying a mouse difficult because gaming mice are only compatible with specific systems. Well, when it comes to compatibility the VicTsing Wireless Gaming Mouse really excels. The VicTsing Wireless Gaming Mouse is compatible with Windows 7, 8, 10, XP, Vista, ME, 2000, and all Mac operating systems. When you lay eyes on the VicTsing Wireless Gaming Mouse you can see that it looks mean, but after you see everything that it has to offer it is hard to say that its performance and offerings aren’t just as impressive. 【 5 adjustable DPI values 】( 2400, 2000, 1600, 1200, 800) resolution Optical tracking technology provides sensitivity and precise tracking on a wide range of surfaces. Meet your multiple needs, either for daily work or gaming.Victsing gaming mouse is definitely an ideal choice for Christmas gift. 【2.4G wireless technology】 advanced 2.4GHz wireless - stable connection, precise track, Fast data transmission speed. 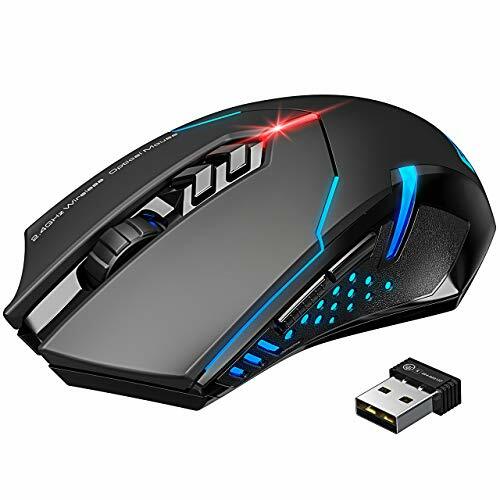 Up to 30ft/ 10M working distance, eliminates delays, dropouts and interference, excellent wireless gaming mouse for both casual and professional gamers. This silent click mouse is impressive in its own right. It offers everything from attractive looks to unbeatable performance. Just look at the impressive wireless technology. With a 2.4G wireless technology, it offers the same features and benefits as the VicTsing mouse mentioned above. It gives the player a stable connection with accurate and precise tracking along with fast data transmissions. This mouse also offers thirty feet of working distance, which is pretty impressive when it comes to wireless mice. Some individuals like a fast response time while others like slower response time. There are some games where you will have the advantage with a faster response time while other games will be better with the slower response times. Whatever situation you find yourself in it won’t matter when you invest in the VicTsing Wireless Gaming Mouse. This mouse offers five different adjustable DPI speeds. You can choose from 2400, 2000, 1600, 1200, or 800. This in combination with the optical tracking technology and you can rest assured that you are going to get sensitivity and precision that will be unmatched. When you invest in a gaming mouse you probably want to get gaming right away. You don’t want to spend hours downloading and installing drivers. Well, that is something you won’t have to do when you invest in the VicTsing Wireless Gaming Mouse. This mouse comes with a unique USB drive that will plug right into your USB drive. When plugged in your computer will immediately recognize the Bluetooth technology and pick put the mouse. With precision and performance backed with looks, there really isn’t much more than the VicTsing Wireless Gaming Mouse could offer. This is certainly one of the best quiet gaming mice on the market. It comes with all the necessary features that gamers need to gain the edge over the competition. This combined with the 12-month warranty and you know you are getting a quality product. Adopted advanced technology, it can not only provide reliable wireless connection but also an accurate tracking. Allowing you move your gaming mouse freely without interference within 10m. Soundless Clicking Mouse: Both left and right keys are silent. Say goodbye to the annoy noises when you are working at home or plays games. Amazing Led Lights: Illuminated colorful Leds that change its color randomly create a wonderful atmosphere, making you indulge in your play, which is really a cool gaming mouse. And the Led lights can be turned off if you do not need. When it comes to looks alone it will be hard for anything to stand next to the VEGCOO C8 Gaming Mouse. This mouse literally looks like the Batmobile. However, do not let the looks alone attract you to this mouse because it certainly does comes loaded with some nice features that will help you crush your virtual competition. Just look at the adopted advanced technology. With this technology, you can rest assured that you are going to get a reliable wireless connection that is combined with accurate and precise tracking. In addition to this, the mouse boasts a 10-meter working distance. The VEGCOO C8 Gaming Mouse isn’t just perfect for gaming, but it really allows the player to customize their atmosphere and create an environment all of their own. The LED light will change colors randomly and create an atmosphere that will match your environment. Keep in mind that the light can be switched off in the event that you do not want to utilize them. One feature that cannot be overlooked with this mouse is the rechargeable Lithium-Ion battery. With this battery, you not only get thirty days of battery life, but the battery can be recharged. This means that you never have to worry about running out and wasting money on those pesky AA or AAA batteries. What’s even more impressive is that the mouse can be utilized when it is charging so you never have to worry about any downtime. Are you annoying those around you with your aggressive clicking? Maybe you can’t hear someone sneaking up on you in the game because the clicking is drowning out all the noise. Well, whatever the situation is this is something you won’t have to worry about when you take advantage of the VEGCOO C8 Gaming Mouse. This gaming mouse comes equipped with technology that makes clicking the left and right buttons silent. When it comes to gaming mice it really is hard to beat everything that the VEGCOO C8 Gaming Mouse has to offer. It is certainly safe to say that this mouse offers features that are both essential and non-essential to the professional gamer.